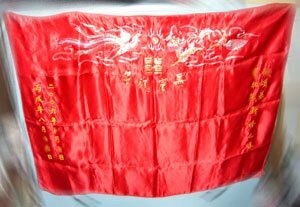 At Chinese weddings (specifically the banquet portion), the tradition is to have a red cloth for guests to sign instead of a guestbook. This also serves as a keepsake for the couple, who can choose to frame it in the future. Before the days of Sharpies and ballpoint pens, ppl would use brush and ink to sign in (a tradition that I'm trying to bring back!). Now with all sorts of permanent markers out there, what I find most annoying about using the cloth is that it's difficult to sign while the cloth moves with the pen. The newer tradition that I've seen at some weddings is to use a large poster, created by the photo studio, with the couple's engagement photo on it. This is a lot easier to sign but since we didn't go with a studio and I like the look of the cloth (kinda like a scroll, in my mind), we're eschewing the airbrushed look for the embroidered look. Our sign-in cloth, nothing at all like I had requested, was recently brought back by Dear's aunt who was vacationing in HK. I wanted something very different from the usual rectangle with the phoenix and dragon embroidered in gold and various colors on top and instead wanted a square piece of cloth with the double happiness character entwined within a fancy phoenix and dragon in the shape of a circle, embroidered in red thread in the center. Alas, this aunt did not abide by my wishes and just brought back the generic kind, customized with our names and date embroidered on the side. Though I may sound ungrateful, I really wish that she would have spent just a little more money on it (we should have given her money beforehand instead of waiting to pay her back, not that she would tell us how much it is *sigh*). It's not the best quality out there (very inexpensive edging -- they couldn't even fold over the ends to sew a smooth edge -- I may just finish it myself with a ribbon) but what worries me is that it's a bit small. It is a mere 34"x27" and would take up less than half a small table (there's even less empty space for signers b/c a significant chunk is taken up by our names/date and the stock embroidery on top). I've never seen one this small b/c even someone who had a 100-person wedding had a larger one than this (his was flopping off the table, whereas ours will sit comfortably with room to spare). With three times that many ppl expected, I don't know what ppl will do when they run out of room. We joked, will they start to sign on the back side (so that when we get it framed, it'd have to be in a see-through frame to view both sides)? I just hope ppl will have the sense not to sign over our names or something. My mother suggested sewing extra fabric around it to make it bigger but I'm sure that will look tacky and piecemeal. The other dilemma is if we don't use the cloth, will the aunt be insulted (though FFMIL did a good job of telling her it was small right to her face instead of thanking her for her trouble -- gotta love Chinese bluntness!). So is it too small? Can I have two cloths side by side? How about taping off sections for VIPs to sign only? Or giving pens with ink that dry invisible to ppl I don't like? hmmm maybe you can have two cloths side by side, or supplement the one cloth with conventional guest book. hi, i love reading your blogs. my question is to your last sentence that caught me off-guard...."Or giving pens with ink that dry invisible to ppl I don't like?" Why are you inviting people you dont like to your wedding?